Eric Davis, Warren Electrical JATC training director, was one of many tradesman who helped set up electrical services on Courthouse Square for this weekend’s Warren Relay for Life. 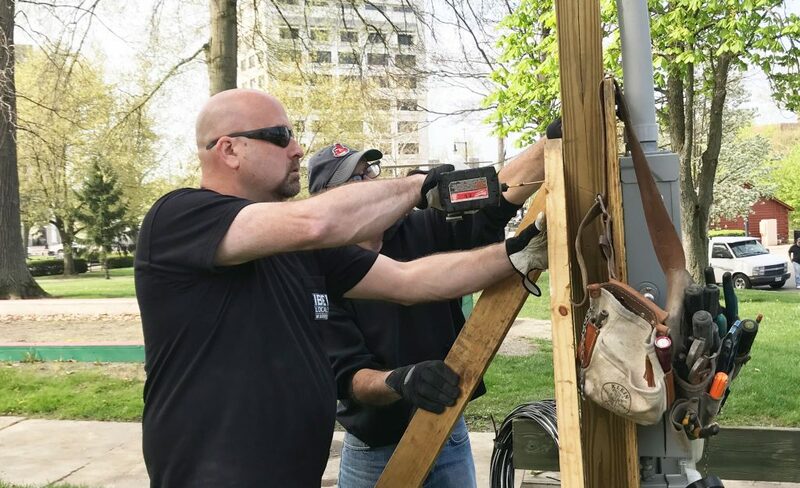 Courthouse Square in Warren was bustling with activity this week as local union electricians continued a long-standing community service initiative. 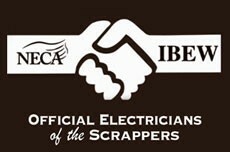 Tradesman from IBEW Local 573 were on hand Monday setting up electrical service for team tents at this weekend’s Warren Relay for Life, a tradition that has been carried on for more than 20 years. The Warren Relay for Life, one of the largest in the state, was started in 1993 and celebrates its 25th anniversary this year. Thousands of people are expected to fill Courthouse Square this weekend. In addition to the set up and tear down of electrical services, tradesmen also give back by raising money through the sale of pulled pork sandwiches and sautéed mushrooms. Members of IBEW Local 573 help carry the 20-plus year tradition of the local electrical union donating its time and talents for the Relay for Life event. The Warren Relay for Life starts Friday, May 11 at 6 p.m. and runs through Saturday afternoon on Courthouse Square. This entry was posted in News on May 9, 2018 by necaibew.